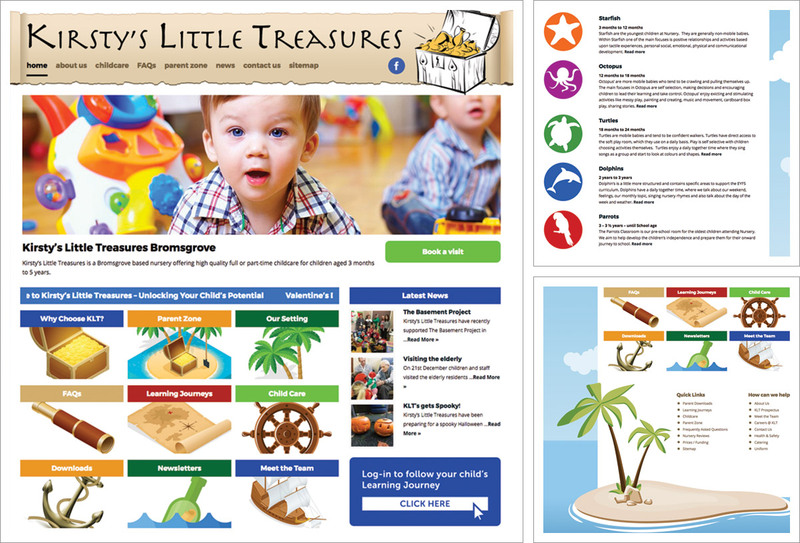 Bromsgrove based Nursery, Kirsty’s Little Treasures wanted to replace their existing website with an updatable, mobile friendly site which could be used as a resource and a communication tool with parents as well as a brochure site for prospective parents and carers. Organisation and availability of content was a big challenge for a project that was so content heavy and we managed this through use of contextual menus delivered via a combination of horizontal and lefthand menus and also creating a specific Parent Zone which uses colourful panels to direct parents to key content. Meeting the KLT communication requirements was achieved by implementing a Latest News section which allows KLT Management to add news items to announce events or share news. Monthly newsletters can be viewed and downloaded on the website. Links to Facebook which is used in conjunction with the website are present on every page. Both the Homepage and Parent Zone have a Ticker Tape message which can be updated by Nursery with short but important messages and reminders. Links to online Learning Journey’s used to record and track the development of the children in their care. Once complete and approved the website was launched in conjunction with a training session to show KLTs how to make updates to the ticker tape, latest news and to update documents. Our new website is up and running and looks fantastic. We are very proud of the new site and our friends at Pedleyonline have done a great job in designing and building a great website that suits our needs very well. There are loads of brilliant features and it contains all the information needed for new parents to get a feel for the ethos of our nursery. For existing parents there are loads of things to explore and download and it’s a great thing to keep as a favourite so parents can check in regularly for updates on upcoming events. We are getting lots of positive comments from parents who are finding it very useful.